KEEN have leapt into spring with a renewed vigour and commitment to ‘taking action’. They have a long-standing philosophy that protecting the places we play, supporting communities in need and reducing impact through actions big and small can make a better world. In demonstration of this, KEEN are taking it to the next level as they host the inaugural Better Takes Action Boat Tour. 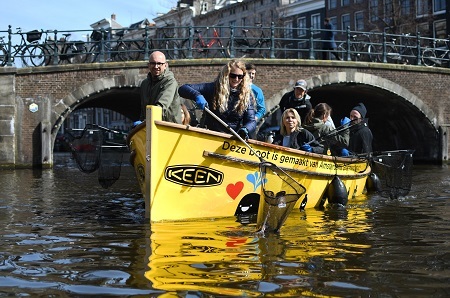 In conjunction with project partners Plastic Whale, the KEEN boat - a bespoke boat made from recycled Amsterdam canal waste - will visit several key European Cities throughout the Netherlands, Germany and the UK across Spring and Summer 2019. Designed to educate and raise awareness of sustainability issues and inspire and engage fans of the brand to get outside and proactively protect outdoor spaces together, this unique initiative provides a hands on opportunity to help address plastic pollution. During the tour, local fans, partners and friends are invited to join the brand and crew the vessel on a plastic ‘fishing’ excursion’ to help clean up polluted waterways, the finds of which will be harvested, recycled and subsequently repurposed for a future life courtesy of Plastic Whale. As part of their ongoing ambassador program, KEEN continue to seek out partners who share their ethics and values, and especially those with an active affinity to protecting the outdoors. Spearheading this tour, KEEN are delighted to announce they will be working with record breaking paddleboarder Cal Major, founder of Paddle Against Plastic and inspirational campaigner who aims to inspire others to care for the environment through adventure. Cal will be accompanying KEEN during all legs of their Better Takes Action Boat Tour this summer, offering an incredible opportunity for fans to join her and to learn more from the inspirational ambassador about how communities and individuals can work together to take action to tackle plastic pollution at source. Marketing Director, Perry Laukens, KEEN EMEA said: “Preserving and protecting the places where people work and play in the outdoors has always been at the heart of who we are as a brand, so we are thrilled to be working with partners like Plastic Whale & Cal Major, who are sharing so many of our values. The series kicked off on April 5 in KEEN’s European home, the Netherlands, which saw the boat making its maiden voyage on the Capital’s canals in Amsterdam. 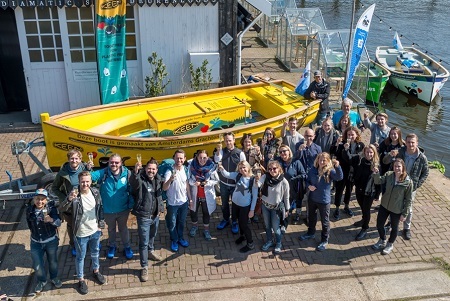 KEEN was joined by local volunteers, friends, partners and brand ambassadors, including Cal Major, who enjoyed a fun afternoon fishing and helping to keep the cities canals free of plastic in the Spring sunshine. The KEEN boat will now set sail for several destinations across Europe during spring and summer 2019 including: Germany, Hamburg – June 22, Germany, München - June 30, UK – London - July 13. During the German leg of the tour, KEEN is delighted to announce events will be hosted in collaboration with the Clean River Project, a non-profit environmental and educational charity that strives to reduce plastic pollution in German waterways.